Hands-On Water/Wastewater Equipment Maintenance, Volumes 1 and 2 deals with equipment maintenance as individual components, not as complete machines, allowing more information about the design, application and maintenance requirements of machinery to be presented. This work-related inventory of wastewater covers plant components where breakdowns most frequently occur. The text explains the design, operation and maintenance of equipment critical to plant functioning; motors, pumps, blowers, mixers and more. The author demonstrates how careful attention to specific equipment parts and operation, especially through systematic maintenance, will lead to fewer breakdowns and more rapid repairs. 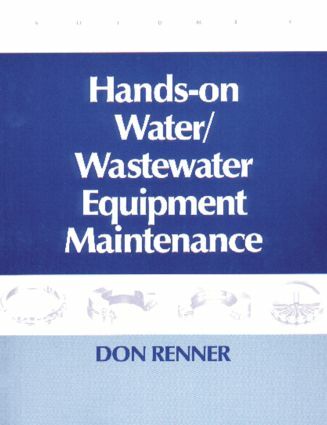 These texts cover basic operating characteristics of machinery components, making them a valuable reference source as well as a training and maintenance manual.Written in easy-to-understand language, without complex formulas or technical theories, Hands-On Water/Wastewater Equipment Maintenance Volumes 1 and 2 provides you with basic information to help you acquire a general understanding of how components function and how to keep equipment operating properly. These two volumes belong in every water and wastewater treatment plant as a reference and manual for equipment maintenance. The hands-on approach provides maintenance operators, crew leaders and supervisors with practical information about how the machinery they work with every day functions, and how to keep it running smoothly.